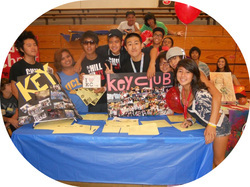 Welcome Key Clubbers, how do you feel? "We feel good, oh, we feel so good, UHH. We feel fine, all of the time. ABOOGAH, ABOOGAH, ABOOGAH, BOOGAH, BOOGAH!" Dont forget to turn in dues for Key Club!!! Are you guys ready for Fall Rally!! !